Believing in intimidating you with its height, Anthony Gallo Acoustics’ Nucleus Reference 5LS speakers tower way above your head. 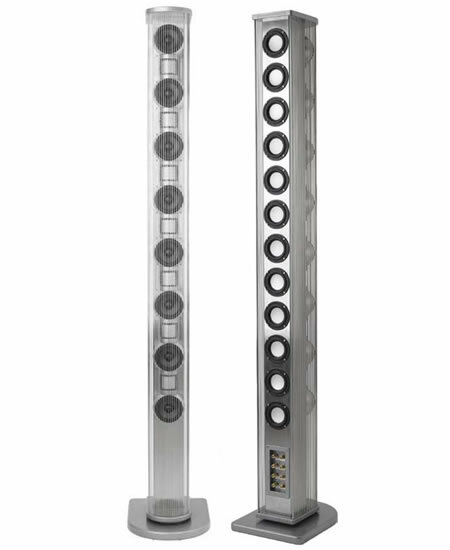 These floor standing loudspeakers are 7-inches wide, 11-inches deep and 78-inches high. They feature twelve aluminum, rear-firing 4-inch subwoofers, eight 4-inch carbon fiber midrange drivers and seven CDT II tweeters. The power handling and frequency response specs are unknown for now, but apparently a high-powered amplifier isn’t required to fill a room with sound. Details on Anthony Gallo Acoustics’ Nucleus Reference 5LS speakers are sketchy, no word on pricing either.